. 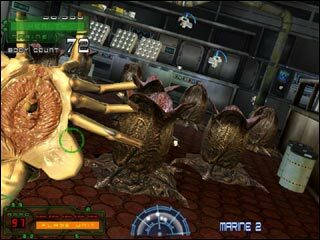 : GLOBAL VR :: Aliens Extermination :. It’s been years since the Colonial Marines left planet LV-426 and the Alien population behind. It’s time to go back to finish off the Alien monsters… and more! The world seems familiar, but the scenario is not. Since the Marine’s last visit, the “Wheland Yutan Corporation”, reprogrammed an army of synthetic humans to stop anything from getting in the way from the Company’s development of their deadly Bio Weapons. It’s not as simple as just killing Mother Alien any more. Warning: This content is intended for mature audiences. Please verify your age below. We're sorry, but you are not eligible to view or download this video. ©2014 Global VR Inc. Trademarks belong to their respective owners. All rights reserved.